Sysessential for MBOX to EMLX Converter is the safest solution helpful for changing MBOX files into EMLX file format. It uses fastest possible conversion speed while migrating bulk emails from one email application into another. There are multiple features inspiring users to convert MBOX files into EMLX file format. MBOX to EMLX Feature Expansion available Here! Sysessential for MBOX to EMLX converter is truly advanced software that scans and upload user’s specified MBOX files into EMLX file. This help in getting view to the MBOX file prior making a final move into EMLX file format. There are two file saving options. It provides the facility for converting MBOX file into already existing EMLX file or else into newly created EMLX file. You have complete freedom to make your choice for any of these options. This software is error-free to work with. It helps in converting only healthy MBOX files into EMLX rather than all. Software is not supportive of converting damaged MBOX files at all. The application is supportive of two different versions including demo edition and fully operable mode. In freeware demo run, users will get to know the features and help in diagnosing the working process very closely. 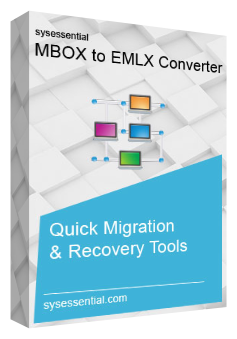 This version will convert first 10 emails from MBOX into EMLX format. On the contrary, fully operable version is supportive of converting complete MBOX files into EMLX file format. The application is supportive of converting MBOX files safely into EMLX file format. Users can access the converted files into EMLX format and access easily in email clients such as Thunderbird etc. Sysessential for MBOX to EMLX converter software supports all Windows OS editions. It follows easy conversion steps for ease to less computer techie guys. Those who do not deep technical skills can also run the application swiftly. Does software supportive of converting damaged MBOX files? How user-friendly is this Sysessential for MBOX to EMLX converter? The application is completely user-friendly utility. Users feel comfortable to run the program even when they are not technically strong. Is user-satisfaction associated with the application? Yes, this application gives satisfied consequences thus no need to worry at all. Is it possible to convert multiple MBOX files into EMLX at single go? Is there any file size issue during email export? Is it easy to manage converted files? Yes, it is manageable to convert MBOX files into EMLX file format. Users hardly come across any complications while converting MBOX data into EMLX file format. What about free trial mode of the tool? The free of cost trial edition is an excellent opportunity for testing the application. You can run this edition for making email export of first 10 MBOX emails into EMLX file format. This will help you to know the real features and working process of the tool. Can I expect desirable conversion results with Sysessential for MBOX to EMLX converter? Yes, you can expect successful conversion of MBOX export into EMLX file format. Now, I came to know the real worth of Sysessential for MBOX to EMLX converter application. It is such a useful application helpful when it is to migrate bulk of MBOX files into EMLX file format. I got some significant emails which cannot afford to lose in any condition thus I decided for testing the functions through free demo. Demo edition has cleared out all the features and working process. I liked demo and after that I invested in fully operable version and migrated bulk of the emails into EMLX file format with ease. Sysessential for MBOX to EMLX converter is the most commendable software tool that supports converting emails from MBOX file format into EMLX file. Before I finalizing the application I checked out features and working procedure which cleared out every doubt. Then I purchased the application and seek best consequences ahead.